Although I love the saying, in my head I always amend “or better yet, befriended” to the end of it. Two authors are mainly responsible for that — Patricia Wrede and Deborah Blake. I highly recommend both if you like strong heroines and magic. Patricia Wrede I first read as a kid, but still enjoy as an adult. Deborah Blake I wouldn’t recommend for kids unless you have mature readers. Both authors are on my short list of books I read when I need a reminder of how to find courage. Deborah Blake is not only an incredible author, but a genuinely amazing person and friend. 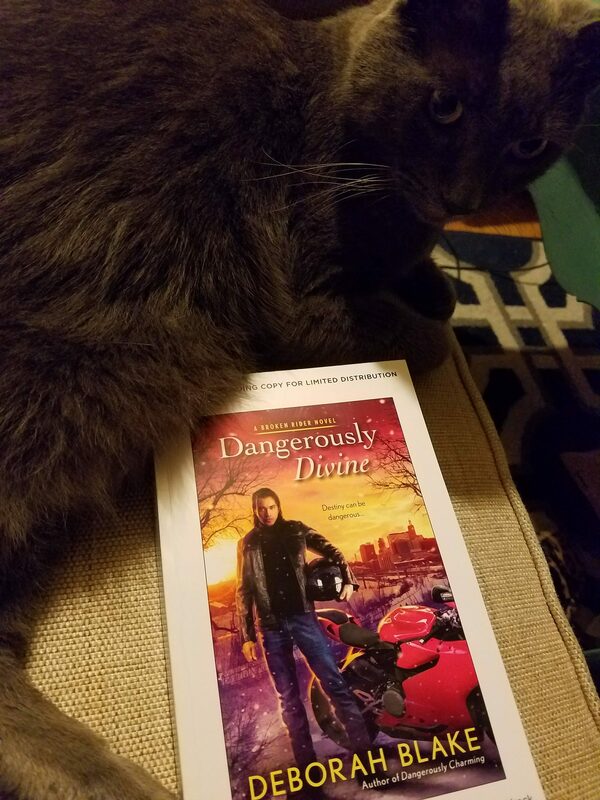 She was kind enough to send me an ARC of her newest book, “Dangerously Divine” which is now out for purchase today! Go buy it, I’ll wait. Toby approves of Deborah Blake. You want more than just an imperative command from me to entice you to purchase a book? Fine, I guess I can understand that. So, let me tell you a bit about the book, the fictional world it’s a part of, and why I love it so much. Dangerously Divine is the second book in Deborah’s Broken Rider series that are a continuation of her Baba Yagas series. You don’t have to read her Baba Yaga series to thoroughly enjoy her Broken Rider series, although I love that series as much as the Broken Rider series. I absolutely love Deborah’s take on the Baba Yaga myth that is the backbone to the shared world. It fits into my (admittedly not massive) understanding of Russian fairy tales, while still being fiercely feminist stories of strong women. The women in both series are strong, though imperfect. Their flaws make them more inspiring heroines. The men are also a far cry from too-perfect-to-be-true male characters, and thus more believable. Despite the magic, Deborah makes her heroines and heroes seem like actual people who could inhabit our real world. Dangerously Divine focuses on Gregori Sun who is trying to discover a new path in life now that his old life has been taken from him. He needs to find both spiritual healing and a way to save his life. Although the cure I need is unlikely to come through magic, I can identify with Gregori. Like Gregori, I thought that I had a calling and something outside my control took that calling away from me. Like Gregori, I struggle not only with a physical ailment but with figuring out my path. Gregori’s search takes him to a Buddhist monastery in Minneapolis that allows laypeople to live and study with the monks, so long as they follow certain rules. Unlike Gregori, I’m unlikely to try either Minnesota or any sort of monastery to figure out my path. While studying, Gregory meets Ciera, a librarian in Minneapolis who helps homeless and runaway teens for deeply personal reasons. Ciera is full of strength and courage that she has honed out of necessity and a desire to keep others from falling into the same traps that once caught her. Reading about people overcoming unlikely odds and finding courage even when afraid, reminds me that such things are possible. Books like Dangerously Divine do more than entertain me or distract me from pain or frustration — they help me stay hopeful and continue to do all I can to fight my disease. I know that bad things exist, books like Deborah Blake’s remind me that bad things, no matter how big and bad, don’t have to win. I’m not crying. You are. I love this. I’m so glad that you not only enjoy the books, but get something more out of them as well. I guess it is a good thing I named the heroine in the third Rider book after you!